My mom has always had a green thumb and I only inherited her fair skin, height, brown hair and facial features. No green thumb here! Seth is constantly reminding me to water my indoor plant. My problem? Overwatering and/or forgetting to water it completely. He has taught me how much the plant actually needs, instead of drowning the poor thing and gives me a gentle reminder each week to water it. It has flourished since I got it in October. So with that said, I was out at the store back in the fall and saw a cute succulent plant in a small round pot. 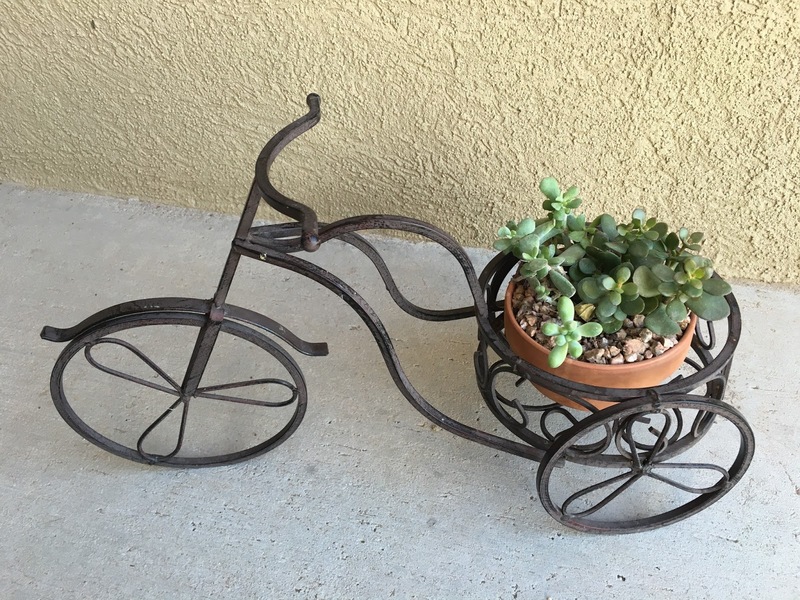 It fit perfectly in a rod iron bicycle pot holder on my front porch. I water it with 4oz (1/2 cup) of water once a week and it's still alive. Seriously, I can not believe it. Small pot of the succulents I bought last fall. Isn't this rod-iron bicycle the cutest? About a month ago, I found some succulents for sale at the local grocery store and snatched them up. I figured they had a chance since the small one I had was still alive. So I spent $24 and split the succulents into two pots. 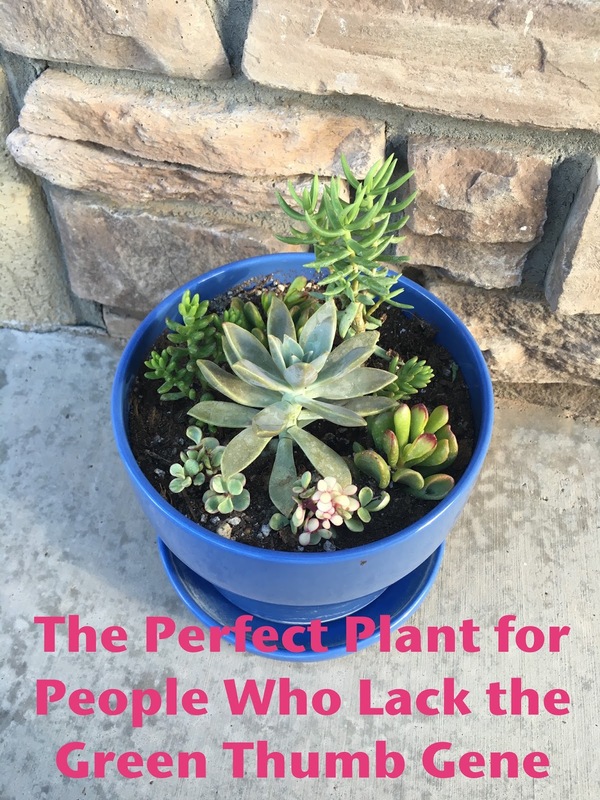 Succulents are fast draining, so that's why you must use the special potting mix listed above. I was going to buy regular potting soil and then add in the vermiculite and perlite, but I didn't need or want HUGE bags of it and that's all that was sold at the store. If I get a large pots in the future, I may consider mixing my own, but for now, the premixed bags are in my opinion the best option. When watering, I typically water once a week in the summer months and once every two weeks in the winter. We have reverse osmosis in our home and you can not use this water to water the plants. I use the water from the hose/spiket outside instead. I give it about 6oz (3/4 cup) of water, but as you can see my pots aren't terribly big. My rule of thumb is to look at the soil and touch it. If it's dry, go ahead and water it. If it's still moist or the soil looks moist on top, don't water it and check on it another day and water if it meets the above criteria. Seth reminded me and once I got into a routine, I didn't have to worry about him reminding me anymore. I suggest setting a reminder in your phone until it becomes a habit. I live in a dry, desert climate. I keep the succulents outside during the winter and summer. You can keep them inside as well, but you will need to follow the other tips I provided. Our typical winter here is 40-50* during the day, 30* at night. Summer is typically 90-100* during the day and 80* at night. If you live where there is humidity and extreme weather conditions, I would talk to your local nursery for tips. Succulents need plenty of light. I have the small on on my front patio, which is in the shade most of the time, but is thriving. The two new pots of succulents are thriving outside facing north and tucked close to the house under the awning/overhang of the roof. Both of them are in direct sun for a few hours each day, but most of the day they are in the shade/partial-sun due to the house casting shadows. Definitely scope out the area where you plan to put them. When my succulents turn 6 months old (from when I purchased and repotted), I will purchase and begin using the succulent food. I can provide an update on how they are doing when I make this change in feeding them. I can't wait to buy more, but I'm waiting for our backyard to get redone before I start buying pots and more succulents. I also started following Instagrammers who post nothing but succulents to get ideas of what I would like to purchase. I am addicted and can't wait to find some with more color than just the shades of green that I have currently. In other gardening news, Seth and I plan to start an herb garden and a vegetable garden using metal horse troughs. Thanks for stopping by JennyPennyAho. Happy planting!